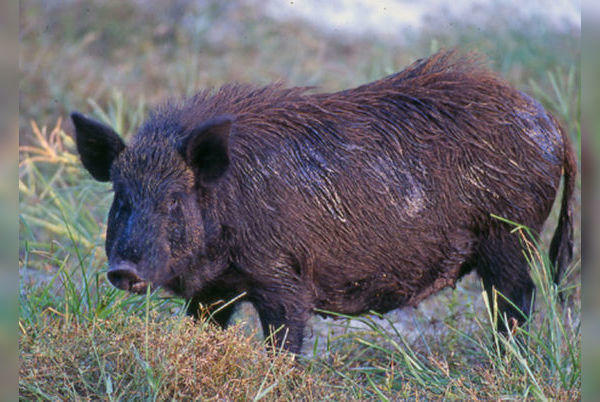 Problem: Wild hogs are hefty creatures that weigh several hundred pounds and terrorize non-native lands, including Florida, where an estimated 1 million or more boar roam wild. They compete for food with deer, turkeys and ducks, have few natural predators (except tigers, which are not exactly a threat in Florida), and uproot wetlands and vegetation with their snouts and tusks. As the wild boar population continues to spread, the animals increasingly come into unpleasant contact with humans. Federal wildlife officials estimate that wild hogs are responsible for $800 million a year in property and crop damage, and about 27,000 auto crashes. Solution: Wild boar has long been a staple of Italian, French and German cuisines and American chefs are no strangers to its domesticated cousin, the humble pig. Todd Erickson, chef at Haven and the forthcoming Huahua's Taqueria in Miami Beach, used wild boar to make carnitas tacos for a recent charity dinner that featured invasive species. "Wild boar is so lean compared to regular pigs," Erickson said. "I knew I had to cook it in a way that would keep the meat as juicy as possible." He braised a whole hog in Corona -- lots and lots of Corona -- and served his tacos with a warm tomatillo salsa. Erickson said he was quite pleased with how the dish turned out. "If I could get a steady supply of wild boar, I would totally keep it on my menu." DISCLAIMER: Improperly prepared boar meat can be dangerous. No means of preparation should be considered risk-free. 1. In a mixing bowl, combine first six ingredients. Set aside. In another bowl, coat boar with olive oil and toss with half of the spice mix. 2. Sear boar in a pan or on a grill over medium-high heat until browned on the outside. Remove from heat and place in a large baking dish. 3. Sprinkle remaining spice mix on boar, then add onions, garlic, jalapeno and beer. The beer should come about halfway up the sides of the meat. 4. Cover baking dish and place in a 375 degree oven for 30 minutes. Reduce oven temperature to 325 degrees and continue to braise for about three hours. Remove from heat. 5. Once cool enough to work with, shred the meat with forks. Pour off the cooking liquid, along with the chunks of onions, garlic and jalapeno, into a blender, and blend until smooth. Pour liquid back over shredded pork. Adjust seasoning to taste. 6. Heat tortillas over a grill and wrap in foil until ready to serve. Add meat to tortillas, then top with radishes, cilantro, onions and salsa. 1. Heat canola oil in a cast iron or heavy-bottomed skillet until lightly smoking. Add tomatillos and char until black on one side. Remove tomatillos from skillet and place in a shallow baking dish. 2. Combine onion, jalapeno and garlic in a mixing bowl, tossing with just enough canola oil to coat. Add mixture to tomatillos in baking dish. 3. Roast in a 500 degree oven until edges of onions are charred. Remove from oven and blend in batches until smooth. When blending final batch, add cumin, coriander, cilantro and olive oil. Adjust seasoning with salt and lime juice.